Markus Zusak’s The Book Thief is one of the most popular books of the century; those who read it treasure it, making it one of the most widely beloved and consistently appealing books of the modern age. 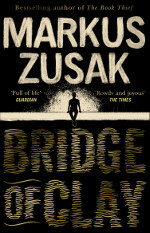 Zusak’s latest book, Bridge of Clay, has celebrated with equally emphatic reviews from readers and critics alike, and it is a story just as moving, compelling, and enriching as any of his previous works. A lost typewriter, a dead dog, and the bones of the snake that killed it – Matthew Dunbar, eldest of five brothers, is on a journey to find them all. Only then can he tell the astonishing story of his family, rocked by tragedy and a long-buried secret. He will learn of a mother who crosses continents for a new home; of a father searching for love in the keys of an old piano; and, finally, of a brother named Clay, who will make the most challenging journey of them all, and change their lives for ever. An epic and spellbinding quest for redemption and greatness, Bridge of Clay will take you to many places, and will ask two eternal questions: where are you going, and who will you be when you get there? Based in Sydney, Australia, we are delighted that Markus will join us across the world for an evening of storytelling, and to celebrate this truly wonderful new novel.